We are a team of Dictation Engineers with over 35 year experience . 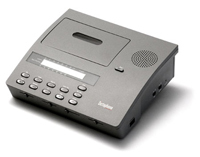 We recondition Dictation machines and resell them at very competitive prices. The machines that we sell cost a fraction of the price of new ones and are fully guaranteed. We also repair all makes Dictation Machine and give free estimates. If you don't want to go ahead, it will cost you nothing.